These month’s reader recipe is an absolute classic. 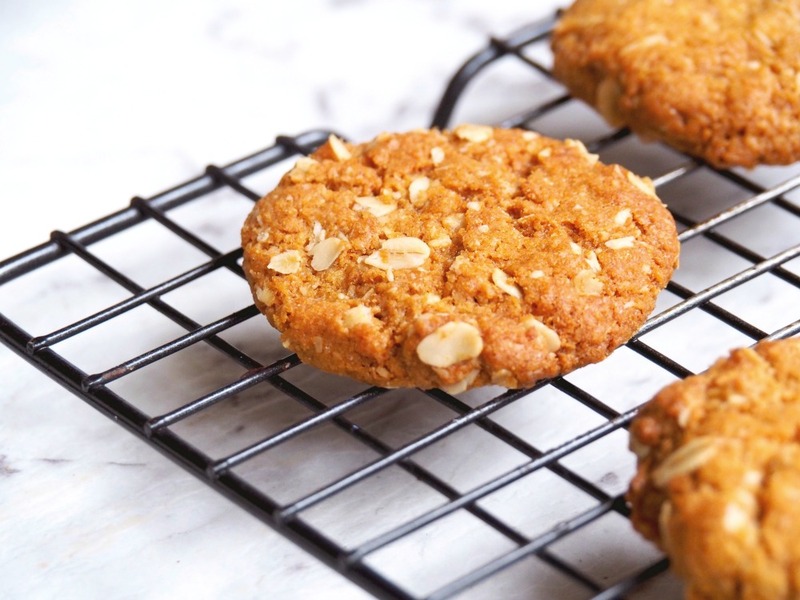 These Anzac Biscuits are quick, easy and in a league of their own. I first tasted these on our amazing weekend away in Berry. 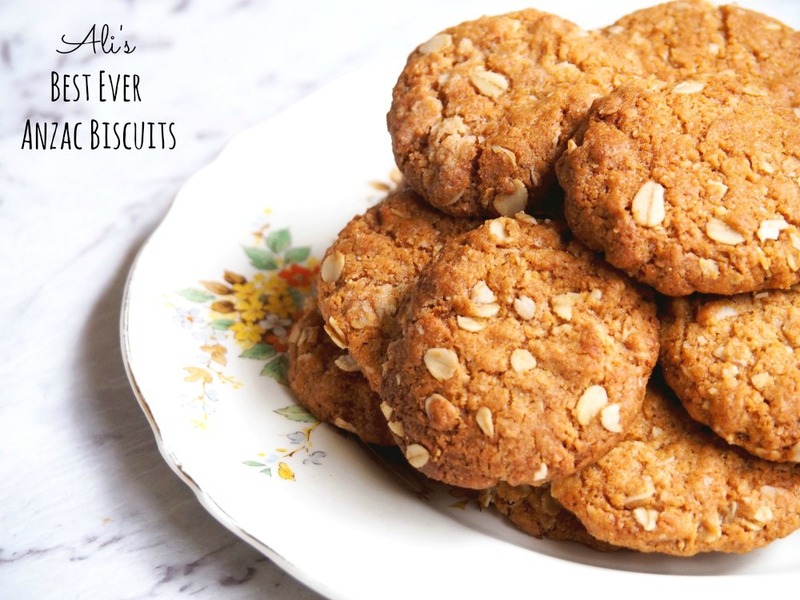 Our wonderful Airbnb host Ali left us a jar of these beautiful biscuits and I loved them so much, I asked her to kindly share the recipe and I’m so glad she did! Side note: Here are my top tips for picking the perfect Airbnb. If you’re new to Airbnb, click my referral link here and you’ll score $55 credit off your first stay! 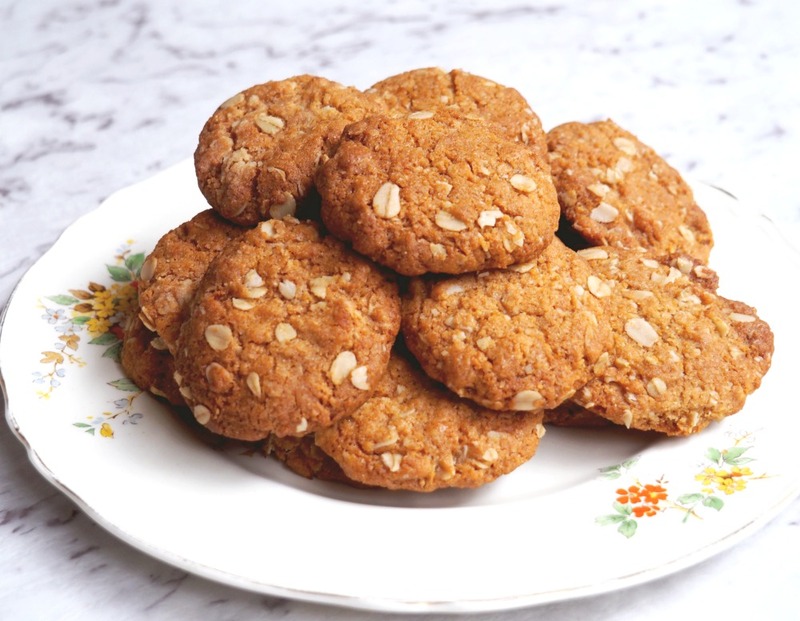 Anyhoo, back to Ali and he recipe… She uses self raising flour which gives them an incredible texture and bonus, they taste exactly like my favourite British biscuit, Hob Nobs. Having just returned from the motherland, I have rediscovered my love of favourite English snack foods; Pork pies, sausage rolls, all the flavours of crisps and don’t get me started on the scone situation. I think my mum was a bit taken aback with my enthusiasm for these delicious (and somewhat unhealthy) snack foods because there was much eye rolling and sighing every time I opened a crisp packet or went out for another scone, but in my defence, savoury snacks were often consumed with a salad and sweet stuff was enjoyed in place of a meal, because let’s face it life is all about balance. Amirite or amirite?! Less that 24 hours after I disembarked at Sydney airport, I had a batch of these biscuits in the oven and they did not disappoint. Plus they tasted just like Hob Nobs which are oats so good! Fun fact, I am old enough to remember the day that Hob Nobs first came out in the shops in the UK (1985, if you’re into biscuit trivia) and what a fine day that was in biscuit history! I’ve been loving on them ever since! 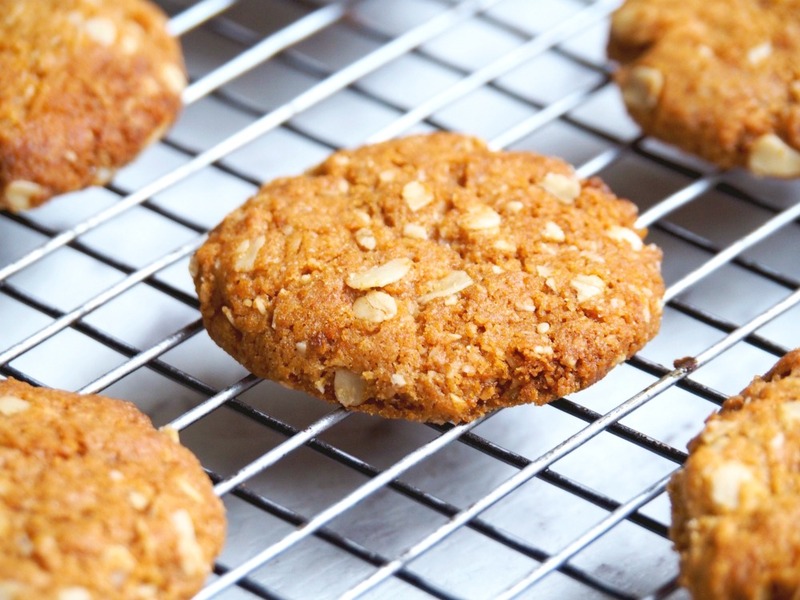 Like all Anzac biscuits, if you like yours crisp and crunchy cook them a little longer because the longer they are baked, the crunchier they get, just like a real Hob Nob! Have you ever had a Hob Nob? What’s your edible guilty pleasure? Preheat oven to 180C and line two trays with baking paper. Sift flour into a large bowl, add a pinch of salt, oats, coconut and sugar and stir to combine. Combine butter and syrup in a small pan and stir over low heat until melted and smooth. Remove from heat. Dissolve the bicarb in the boiling water in a small cup. Add to the saucepan and stir. Pour the wet mixture over the dry ingredients and mix well. Place teaspoons of mixture on to tray allowing room for spreading. Press down gently with a fork. spreading. Bake for about 10-15 minutes until golden brown. Allow the biscuits to cool on trays for 5 minutes before using a wide spatula to move them on to cooling racks. Add flour to TM bowl, add a pinch of salt, oats, coconut and sugar and combine for 5 seconds on reverse speed 3 and set aside. Add butter and golden syrup to TM bowl and melt for 3 minutes at 60C on speed 2 or until completely melted. Dissolve the bicarb in the boiling water in a small cup. Add to the melted butter mixture and allow to stand for a couple of minutes.